Although ads are annoying for the most of us, the also allow businesses to push new products or services. 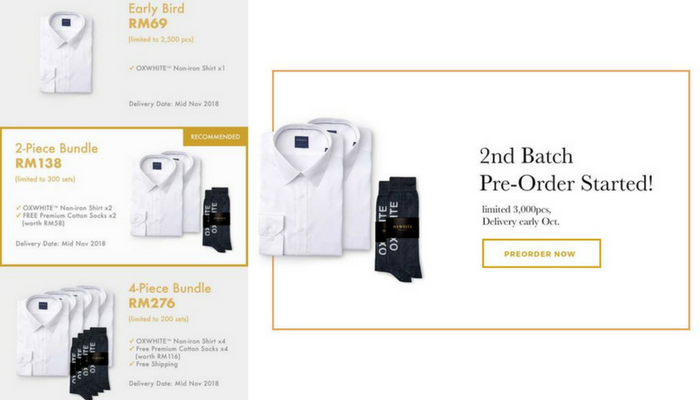 Oxwhite managed to sell 3,000 shirts within 6 hours on launch day and generate hype thanks to their marketing strategies, which we take a look at. As an ad-hater, I can say that if an ad catches my attention, I would at the very least click into it to find out more about it. So far, one ad on Facebook has stood out over the past months or so. The advertisements are everywhere on Facebook. Since their advertising was so rampant, I wanted to find out why their way of marketing worked, rather than the normal ones we see where we just scroll past. Oxwhite targets users differently, and one of them is based on the language that you use, or to be more precise, your language settings on Facebook. 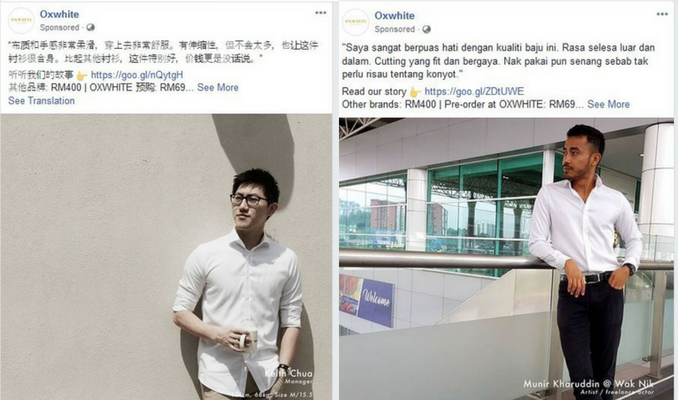 Oxwhite’s advertising with different languages and personalities. As Malaysians are a diverse bunch, it is very important that advertising covers the different demographics of Malaysia, if your product is meant to appeal to them all. So if your Facebook language is set to Chinese, you might have sees the left ad and so on. Not only the message is crafted in the language of your choice but the talents featured are also familiar faces. For the English ad, the personality is the founder of Fitgear, Tai Zi Kang (who has had his own brush with viral Facebook marketing), for the Chinese ad, it’s the manager of Bean Brothers, Keith Chua, and for the Malay ad, it’s a well-known actor Wak Nik. Gaming publishers spend a great deal of time and effort crafting their pre-order strategy to generate buzz and early sales for their titles. However, the pre-order concept has been adopted by other product categories such as consumer electronics (the iPhone, for example), book and album releases, and even automobiles (I’m looking at you Tesla). On average, Scalefast found out that sales made on the first available day for these pre-orders accounted for 28 percent of the entire pre-order campaign. This figure applies to the most successful pre-order products, and only to exclusive items offered in limited quantities. 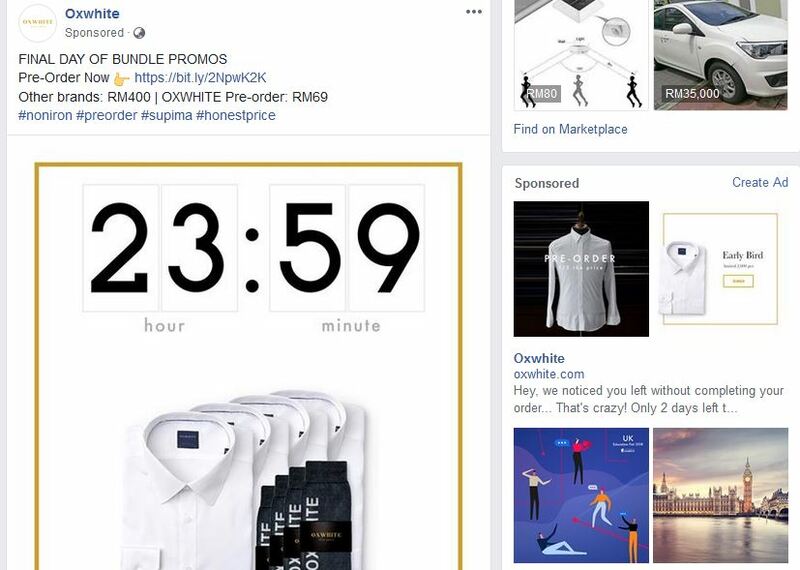 This principle held true for Oxwhite, as they sold 2,500 pieces in their first 3 hours of launch, according to their Facebook posts. They only had a limited amount of 3,000 shirts and it was all gone within 6 hours. At that 3 hour mark, they also put out a post with the gist of “only 500 left” which must have helped drive in some last minute orders and FOMOs (fear of missing out). In fact, response was so good that they were able to start a second pre-order batch immediately with another limited quantity of 3,000 pieces. When something is limited, people tend to have the fear of missing out and want in on it, thus having a limited supply of products works in the brands favour most of the time. Nowadays, any old boring post won’t do well as it is likely to go unnoticed. Instead, brands have to post something engaging, something that will grab peoples’ attention, and perhaps even something with a prize attached. For example, post a photo of your product from your business and suggest that every like/comment/share puts them in the running for the prize shown. Without even knowing it, people who may have never even heard of you are referring you to their network of people on social media. Hundreds, or potentially thousands, of new eyes are now noticing your social media presence. 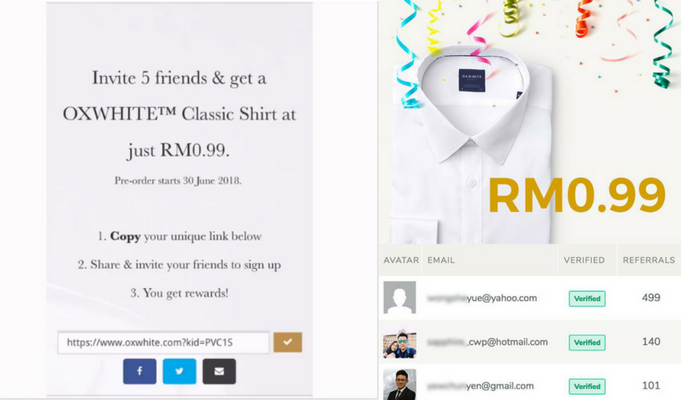 Oxwhite used this to their advantage by offering a limited number of RM0.99 shirts for people who get 5 friends to sign up on their platform. This seemed simple enough—the top person had almost 500 referrals under his name when he only needed 5. Honestly I wanted to do it too but I’m not the type of person who spams people with referral codes unless they too show an interest. Through this referral program, once people have signed up with Oxwhite, they will be included in their marketing newsletter, which becomes another source of potential customers for Oxwhite to reach out to. I can say their strategy worked on me. I don’t usually buy any products from Facebook ads, especially a product that nobody has heard of or tried before. But I caved in and bought it as I wanted to see what the hype was all about. At the same time I needed a white formal shirt (which they claim doesn’t need ironing) as my old one was worn out (and yes, this means also that this post is not sponsored). 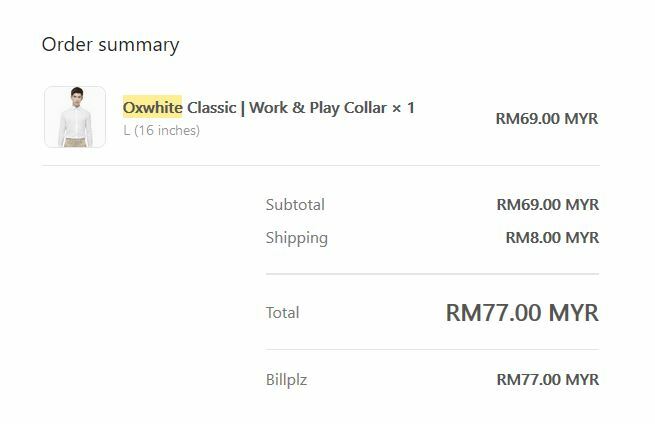 Although it will take 120 days and delivery is set at late September, I can’t wait to get it and see if it really has the quality of a RM400 shirt. Maybe I’ll write a review article on that when I get my hands on it. To find out more about Oxwhite and their products click here.